Today was mostly a travel day. I woke up in Varkala and said my goodbyes to Suze, Ana and Debra then caught a plane from Trivandrum to Chennai, then a plane from Chennai to Delhi. It was about 10 hours door to door and by the time I arrived in Delhi it was early evening and I was famished. I had arranged for a hotel transfer since Delhi taxi drivers are notorious for giving tourists the run around with hotel scams. I checked into the Hotel Sunrise in Karol Bagh (I do not recommended, TripAdvisor Review coming soon) where I was scheduled to meet up with a G Adventures group touring Rajasthan, Agra and Varanasi for the next 20 days. It’s a bit like being on the Real World with tour groups. Luckily what started out as a group of 11 strangers quickly became a group of 11 friends with a common passion to travel and explore India. We were led by Dushyant, a G Adventures local CEO responsible for getting us around and arranging activities in each of our stops. I missed the orientation meeting and dinner due to my late arrival so met the group the following morning. I was able to meet my roommate the first night, Katy, from Leeds. She got me up to speed on the next day’s plan as I ate room service and got ready for bed. I went to bed happy the long day of travel was over and excited about the next three weeks, the sights, people, food and culture I was going to experience with new friends. I woke up dreaming of room service; pancakes, oj, eggs. I think my light dinner contributed to my waking hunger and knowing I had to be packed and ready to go at 8AM got me out of bed bright and early. I finally met Dushyant and my group in the lobby. 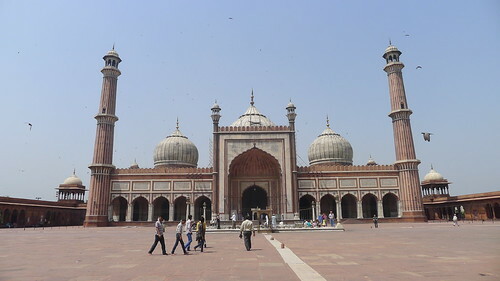 We set off for breakfast nearby in Karol Bagh, then took the metro to Chandni Chowk to visit the Red Fort. I found it interesting that the first car on the train is reserved for women only. Exiting out of the subway station at Chandni Chowk was intense. The crowds, traffic, heat and smells are overwhelming. So glad we had Dushyant to show us the way to the Red Fort. 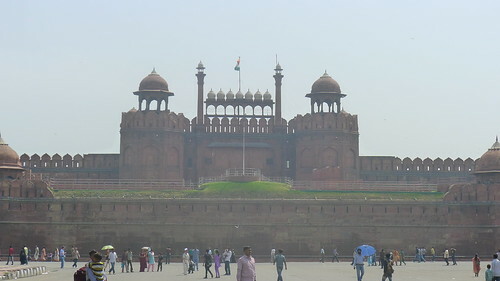 We took pics of the exterior then wandered through narrow streets to enter the Red Fort. We had to put on long dresses to cover our legs and arms which was comical as they looked like big Muumuus. The inside of the Red For was dazzling. It’s beautiful ornate arches catch the eye and draw your view to where it’s towers reach the blue sky. 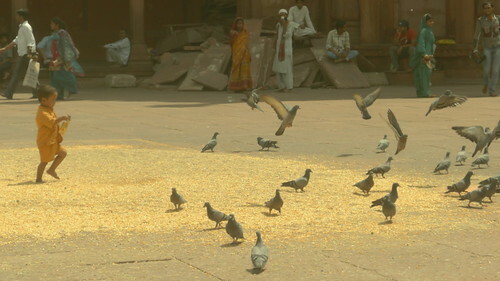 There were lots of tourists and locals hanging out taking pics and feeding the birds. 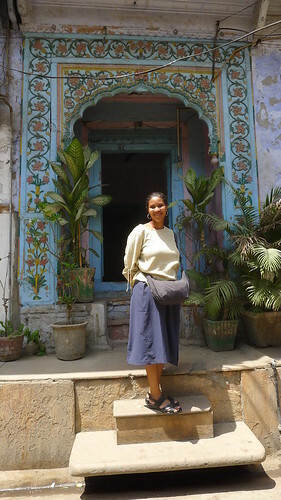 After, the Red Fort we walked through more of old Delhi admiring the architecture and colorful streets. Our next destination was a Sikh temple where we observed prayers, songs and volunteered in their kitchen rolling out dough for Chipatis. 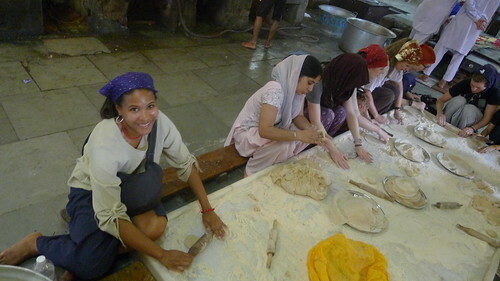 The temple is quite remarkable in that all the staff are volunteers and they feed 10,000 people a day for free. It felt great rolling out the dough and watching it get baked and collected for the daily lunch service. 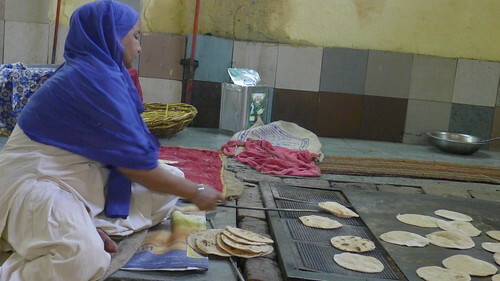 After we rolled out the dough we enjoyed the free lunch of dal, chipati, aloo ghobi and ate with the locals. It’s a side of Delhi I felt lucky to experience and be a part of. Big thanks to Dushyant for showing us something off the beaten path. 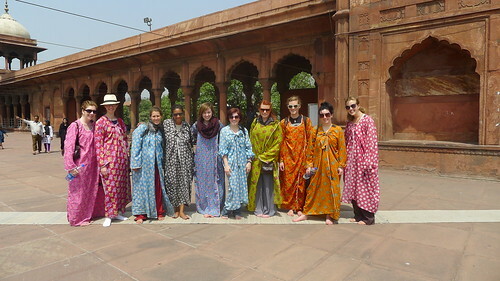 After lunch we collected our bags and traveled by car to the Delhi train station. Here too, I found the scene to be intense and chaotic. Perhaps reading about pickpocketing happening here or just the unorganized mass of people pushing their way past security put me on edge and alert. Not wanting to be a victim I guarded my belongings extra hard as we waited for our train on the hot over crowded platform. Thankfully our train arrived and I got settled in on a top bunk for the 13 hour journey to Bikaner. I got out my trusty sleep sack, some fruit I’d bought earlier that day and my nook and the hours flew by. Before I knew it I was tired and ready for bed. I found the motion of the train soothing and it lulled me to sleep as we headed north west to the desert state of Rajasthan.